CEOs: They used to be just like us. Well, at least a lot more like us. Thirty years ago, the average chief executive of a large public company earned less than 30-times more than the typical worker. But today they rake in between 202 and 273-times the pay, as shown in the graph below from a new Economic Policy Institute paper. 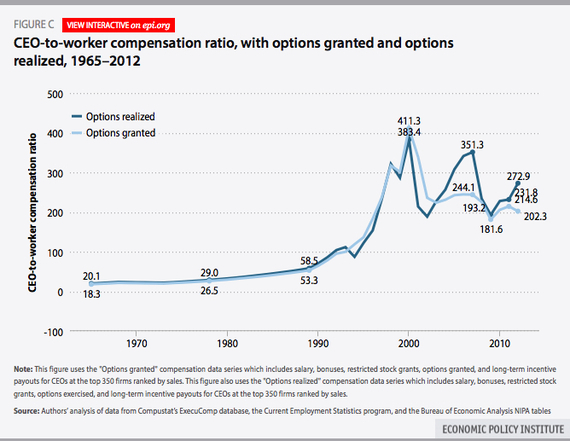 From 1978 to 2012, CEO compensation measured with options realized increased about 875 percent, a rise more than double stock market growth and substantially greater than the painfully slow 5.4 percent growth in a typical worker’s compensation over the same period. 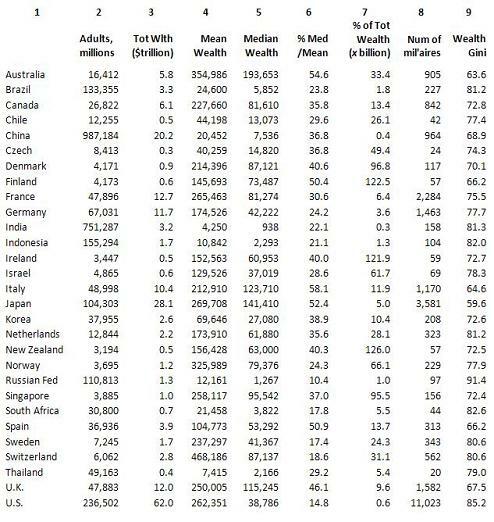 To view Column 7 in another way, a middle-class adult in Finland owns $122 for every billion dollars of his or her nation’s wealth. In Canada it’s $13. In the U.S. it’s 60 cents. Only China (40 cents) and India (30 cents) give their middle-class adults less. Journalist with the YourHub section of The Denver Post and administrator of the Denver Newspaper Guild website. After thirty-plus years of trickle-down/supply-side economic policies, isn’t it clear to everybody that the experiment has failed? Can we please go back to a tax structure, trade policies, and corporate/banking regulations that made the economy work for all of us?